Revolver is a new work by HC Gilje, commissioned by Sonic Acts and developed for The Dark Universe exhibition at NASA, Amsterdam. 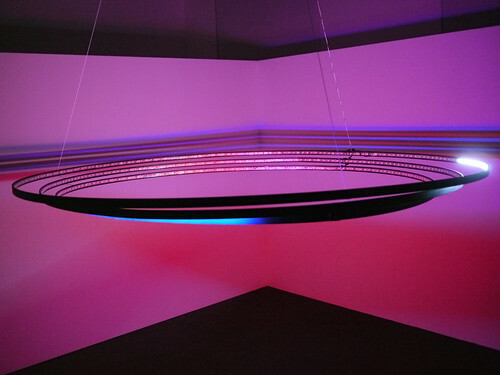 It evolved from Gilje’s earlier light installation 7 Cirkler (ZKM, 2012). It is a structure of light animations using three circles of LED-lights. Combined together this produces complex patterns of light and shadow on the walls in the exhibition space. Revolver and 7 cirkler have several things in common: light animations moving on the inside of circles suspended from the ceiling, casting shadows of the circles onto the surrounding walls. They both use white, red and blue, and they both exploit the effect of complementary colours that appear in the shadows. They are put together quite differently though. 7 cirkler is a composition clearly connected to the music of Else Marie Pade: The light moves upwards in the circles with alternating white and blue circles and descend with alternating white and red circles. Revolver consists of three circles which are spaced as tightly together as possible to achieve a very narrow band of colors on the walls. They are hung at eye-height with the idea that people will first discover what is going on on the walls rather than look at the lights. The walls are a much more integrated part of the work in revolver, as the shape is designed to work with the projections from the circles. The biggest difference is the structure and relation of light and sound. 7 cirkler was a composed piece. I think of revolver more as a audiovisual-spatial drone, an endless loopmachine: It is basically the layering of simple loops resulting in a more complex structure. 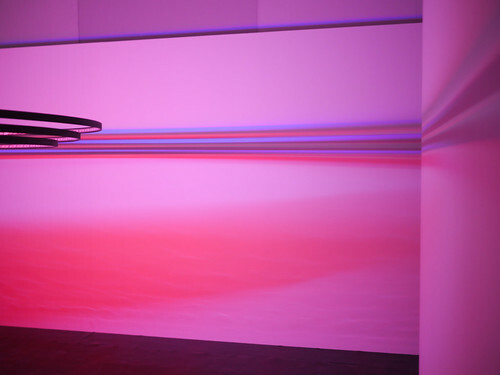 Loops of lights and sound are brought into the exhibition space, where they are tuned and mixed in the physical space. So it is the interference of sound and light waves, together with the physical construction of the circles and surrounding walls that creates the mix. 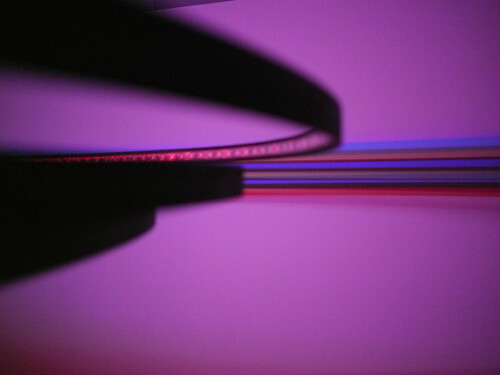 This means I have a vague idea of what might happen when I start setting up the installation, but it´s really working in the space (experimenting with speed, width and color of light) that determines how the installation turns out. The combined movement of light and sound creates a space that revolves around you. In much of my work I seek through repetitive slow movements to create something that resonates with the body, establishing a correspondence between mind and the physical space through the body.